Retired Feb. 1, 1973. Died April 12, 2005. Major General Lee V. Gossick was chief of staff, Headquarters Air Force Systems Command, Andrews Air Force Base, Maryland. General Gossick was born in Meadville, Missouri, in 1920. He attended Meadville public schools and received his bachelor and master of science degrees in aeronautical engineering from Ohio State University. He graduated from the Air War College, Maxwell Air Force Base, Alabama, in 1959, and attended Harvard University for advanced management studies in 1961. He entered the military service in 1941 as an aviation cadet and received his pilot wings and commission as a second lieutenant in April 1942. He was assigned as a fighter pilot with the 87th Fighter Squadron, 79th Fighter Group, from August 1942 to September 1943. As operations officer of the 87th Fighter Squadron he served in Egypt, Libya, Tunisia and Sicily, where he flew 88 combat missions in P-40 aircraft. He was credited with destroying two Me-109 German aircraft, as well as two probable kills. He returned to the United States and was assigned to a fighter training unit at Sarasota, Florida. In September 1945 he was transferred to Headquarters Tactical Air Command, Langley Field, Virginia. He attended Ohio State University from 1947 to 1951 under the Air Force Institute of Technology program and earned his bachelor of science degree and master's degree in aeronautical engineering. In March 1951 he was assigned to Headquarters Air Research and Development Command, Baltimore, Md., as project engineer, Directorate of Research and later became chief, Air Defense Systems Division. In September 1955 he was transferred to the European office of ARDC at Brussels, Belgium, where he served as vice commander and subsequently as commander. Upon his return to the United States in July 1958, he attended the Air War College and graduated in 1959. He then was assigned to Headquarters U.S. Air Force, where he served as deputy chief, Defense Systems Group, Deputy Chief of Staff, Development; executive officer to the assistant secretary of the Air Force (Research and Development); chief, Space Division, Directorate of Advanced Engineering; and finally as deputy director of development, Deputy Chief of Staff, Research and Development. He attended the Advanced Management Program at Harvard University in 1961. In July 1964 he became commander of the Arnold Engineering Development Center, Air Force Systems Command, Arnold Air Force Station, Tennessee. In September 1967 General Gossick was assigned to Aeronautical Systems Division, AFSC, at Wright-Patterson Air Force Base, Ohio, as deputy for the F-111 Program, In December 1968 he became vice commander of Aeronautical Systems Division, and in August 1969 assumed the position of commander. 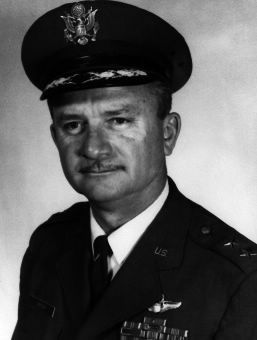 General Gossick became deputy chief of staff, systems, Air Force Systems Command, Andrews Air Force Base, Maryland, in June 1970, and in August 1971 became chief of staff, Air Force Systems Command. His military decorations and awards include the Distinguished Service Medal, Legion of Merit with oak leaf cluster, Distinguished Flying Cross, Air Medal with nine oak leaf clusters, Air Force Commendation Medal, and Distinguished Unit Citation Emblem. He holds the aeronautical rating of command pilot. In May 1960 he was designated a Distinguished Alumnus by Ohio State University. In April 1967 he was the recipient of the Arnold Air Society's General Hoyt S. Vandenberg Trophy "for outstanding scientific contributions to aerospace development in the field of science." He was selected as a Fellow of the American Institute of Aeronautics and Astronautics in October 1970. He also received the Ohio State University Centennial Achievement Award in December 1970. General Gossick's hometown is Meadville, Mo. He was promoted to the temporary grade of Major General effective April 1, 1968, with date of rank Jan. 11, 1964. 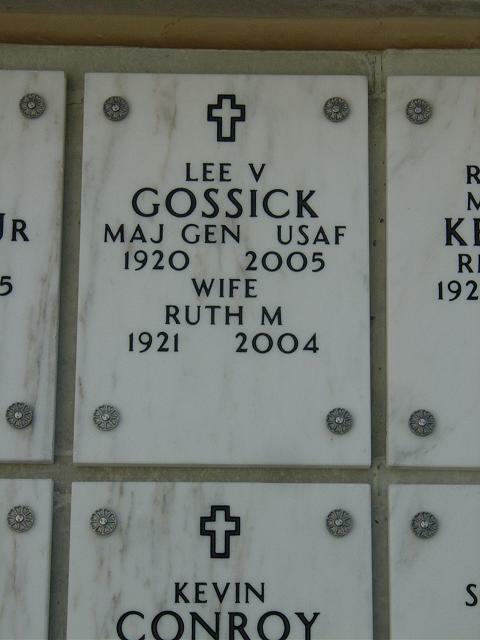 General Lee V. Gossick, age 85, died April 12 at Harton Regional Medical Center in Tullahoma, Tennessee. A native of Meadville, Missouri, he has been a resident of Coffee County since his retirement from Air Force and Federal Government civil service in 1980. General Gossick entered the U.S. Army Air Corps as an Aviation Cadet in September, 1941. He graduated from flight training at Victoria, Texas, was commissioned, and married to Ruth Matter, of Mt. Clemens, Michigan on April 29, 1942. After training in the P-40 in New England, his unit, the 79th Fighter Group, left in September, 1942 for Egypt and operations in support of the British Eighth Army. He flew 88 combat missions in North Africa, Sicily and Italy. After the war ended, he attended Ohio State University, receiving his bachelor’s and master’s degrees in aeronautical engineering in 1951. Among his assignments in the Air Force’s research and development activities were as Commander of the European Research and Development Office in Brussels, Belgium, Commander of the Arnold Engineering Development Center at Tullahoma, Tennessee, Commander of the Aeronautical Systems Division, at Wright-Patterson Air Force Base, Ohio, and his last assignment, as Chief of Staff, Headquarters, Air Force Systems Command. After retirement from the Air Force in 1973, General Gossick joined the US Atomic Energy Commission, serving as Assistant Director of the Department of Regulation, which controlled the usage of special nuclear materials for electrical power generation, medical applications and other industrial non military purposes. When the Atomic Energy Commission was abolished in 1975 and replaced by the Energy Research and Development Agency and the Nuclear Regulatory Commission, General Gossick was appointed the Executive Director for Operations of that Commission. In 1980 he joined Sverdrup Technology, Inc., and served as deputy general manager of the AEDC Group, which provided services under contract to the Air Force at Arnold Engineering Development Center at Tullahoma, Tennessee. Following retirement from Sverdrup in 1989, General Gossick served as consultant and Chairman of the Sverdrup Advisory Council. He was a member of the First United Methodist Church in Tullahoma, a member and Paul Harris Fellow of the Tullahoma Rotary Club, and member of the Tullahoma Industrial Development Board. General Gossick was a graduate of the Air War College and the Harvard Advanced Management Program. He was designated a Distinguished Alumnus by the Ohio State University in 1960, and in 1967 was presented the University’s Centennial Achievement Award. In 1967 he was the recipient of the Arnold Air Society’s General Hoyt Vandenberg Trophy for “outstanding contributions to aerospace development in the field of science”. In 1970 he was elected a Fellow in the American Institute of Aeronautics and Astronautics. In 1974 he was presented the Atomic Energy Commission’s Distinguished Service Award. He was named an AEDC Fellow in 1991. His military awards include the Distinguished Service Medal with Oak Leaf Cluster, the Legion of Merit with Oak Leaf Cluster, the Distinguished Flying Cross, and the Air Medal with nine Oak Leaf Clusters. In 2004, General Gossick was inducted in the Tennessee Aviation Hall of Fame. Memorial Services will be held at the First United Methodist Church in Tullahoma at 11am, Saturday, April 23 with Dr. Bill Starnes and Rev. Jim Beaty officiating. His family will receive friends in the reception room immediately following the service. His cremated remains will be interred at the Arlington National Cemetery. In Lieu of flowers the family asks that memorial contributions be mde to the Hospice of the Highland Rim, 110 E. Lauderdale St., Tullahoma, Tn. 37388; First United Methodist Church, 208 W. Lauderdale St., Tullahoma, Tn 37388; or Partners for Healing, PO Box 1601, Tullahoma, Tn. 37388.